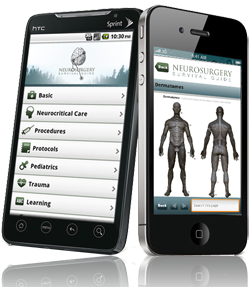 Just wanted to let you know that the new version of the Neurosurgery Survival Guide Pocket Edition is Finally available! There are many new sections added / updated and or revised! 142 pages long. Perfect for pocket reference. You can order by clicking the links above or to the side. New Sections added to the NSG! Is there something you would like to see added? I recently updated much of the trauma guidelines to include the Brain Trauma Foundation guidelines for management as well as use of evidence based indications for surgical or medical intervention. I have also added a significant number of references for each of the guidelines and recommendations. Welcome to the New home of the Neurosurgery Survival Guide!